McMullin: Kristi, I was first introduced to your poetry in 2013 when I had the privilege of publishing “Portrait of You as Appalachia and Myself as Nike of Samothrace,” in the Spring Issue of So to Speak: A Feminist Journal of Language and Art. This poem is a centerpiece in your newest chapbook, Daughter Shaman Sings Blood Anthem, (Porkbelly, 2017) and I am finding myself still entranced by the poem’s mythical revision turn toward surrealism. Your ending line, “I throw my head back so far/it disappears,” still shoots chills through me. I’m interested in your blending of myth-retelling and surrealism as a poetic trait and what effect these modes of exposure may have on a story. Carter: Thank you, Sheila. I’ve always been intrigued by the surreal. In major ways, I see surrealism as an attempt to consolidate trauma into a sense of the absurd as a supplemental contrast to the polemic of myths. So in the surreal, we must surrender because anything can happen and ultimately it may not matter, and in myths, we must surrender because it matters very much that anything can happen. That way of forging reality into a new shape is integral to exposure as it is part of making sense of trauma. There’s no good sense in why the trauma began necessarily (in a perfect world) but by exposing it—validating it—it can be reshaped into some means toward survival and empowerment. McMullin: In an interview I did with Diane Raptosh for ROAR Magazine: A Journal of the Literary Arts by Women (Spring 2014 Issue) on her book American Amnesiac, I spoke with her about my concept of “bravery training.” Bravery Training being an intentional act of challenging one’s self to do something that might induce fear, but which contributes to a better understanding of one’s self, and that could, in turn, potentially serve community in a meaningful way. Carter: I like the term “Bravery Training” and it fits, I would agree. Those lines deal with my efforts to force myself into recognizing not all families are dysfunctional or abusive, which in my case, means having to intentionally deprogram myself of what the term ‘family’ means. As for community, the balance of exposing oneself and allowing room for dialogue around the risks that poetry takes seems to be one desirable outcome of how a group my collaboratively do Bravery Training together. Is this your wish for Daughter Shaman Sings Blood Anthem? As I’ve never published a chapbook myself, I’m wondering what the process was in deciding that Daughter Shaman was complete enough to send out as its own encapsulated project, and how you see this chap evolving into something potentially larger? How does this evolution create dialogue between the manuscripts? How would a full-length collection further complicate and expand upon your themes? Carter: This is a dream question for a writer! As the tropes of DSSBA run so deep in my psyche, it has long been a massive undertaking both literally and psychically. I see publication of the full-length extension of DSSBA as the goal for the manuscript. The nuances in that manuscript involve my own sexual orientation and my relationships with other family members in more poems. This highlights the difference between the longer version and the chap as the chap version focuses on myself and my mother. That is still the dominant theme of the full-length, but the room of a longer book allows for more connections outside that main relationship. McMullin: Several of your poems revolve around the image of a knife cutting through skin, the palm of a hand, through paper, through the earth, cleaving one thing from another. Your book seems to almost be documenting the collection of removal. How many times can one body be cleaved? How does the daughter in your work function within presumptions of motherhood? Carter: Funnily enough, my partner was wondering this too when he read poems from this series. The need to remove myself from larger ideas of motherhood mirrors the literal remove my mother and I inhabit from each other in real time. When drawing a boundary from harm, it is much like a surgery of removal: there’s a violence of severance needed in order to promote healing and a new, alternate sense of wholeness. Socially, daughters are conceived of as not-mothers, or as potential mothers. That too bothers me, and perhaps the surgery is an attempt to undo those presumptions in combination with my own personal struggles with being a daughter to my own mother. McMullin: Finally, as a writer, feminist, and academic – all identities both personal and political – what insights can you provide for building classroom community that both challenges students to come to their own conclusions about the way in which they choose to navigate the world and includes intersectional conversation? Carter: This is an ongoing challenge for me. Students are more aware of social conversations about diversity, inclusivity, and trauma than ever before, but they are still students, and thus learning. What that means is often the emotions are raw and electric without access to a language that isn’t binary and angry, even when it appears as empowering. Some students misappropriate activist rhetoric to pre-emptively silence others which I do my best to mediate, but on a macro-level it means that the classroom is becoming a different space, one in which activism is experimented with to varying levels of success. Like most things, the best case scenario is when students can trust the things a professor won’t budge on (ex: reproductive rights), but be graceful when the professor fumbles (ex: misusing some new word). Our worlds are different but they intersect, and that’s where the hope of collaboration lives. This interview took place through email exchanges. Stay tuned for Documenting the Collection of Removal: A shared interview between poets, Kristi Carter and Sheila McMullin, Part 2, Kristi Carter interviews Sheila McMullin in the June issue of Tinderbox! 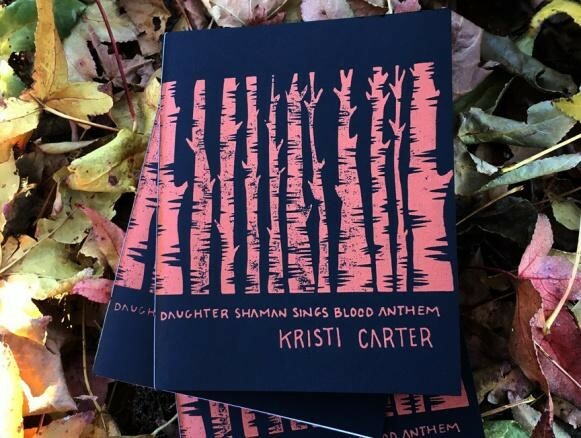 Kristi Carter is the author of Daughter Shaman Sings Blood Anthem (Porkbelly Press) and Cosmovore (Aqueduct Press). Her poems have appeared in publications including So to Speak, poemmemoirstory, CALYX, Hawaii Review, and Nimrod. Her work examines the intersection of gender and intergenerational trauma in 20th Century poetics. She holds a PhD from University of Nebraska Lincoln and an MFA from Oklahoma State University. Sheila McMullin is author of daughterrarium, winner of the 2016 Cleveland State University Poetry Center First Book Prize chosen by Daniel Borzutzky. She co-edited the collections Humans of Ballou and The Day Tajon Got Shot from Shout Mouse Press. She is a community organizer working with youth to amplify their voices through storytelling and civic participation. She sat on the board of VIDA: Women in Literary Arts from 2015-2017. She holds an M.F.A. from George Mason University and volunteers at her local animal rescue. Find more about her writing, editing, and activism online at http://www.moonspitpoetry.com.